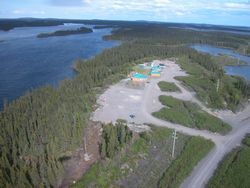 In June, Ruth and I were sent to Labrador, which is on the east coast of Canada, to do a prospecting job. We were working indirectly for a company called Monster Copper. Tom Setterfield was the geologist in charge of the program, which lasted 2 weeks. It was a great experience. Having never been to the east coast, we saw a whole province and met lots of interesting people. For the first week, we stayed at a fishing/hunting lodge: Northern Lights Lodge. 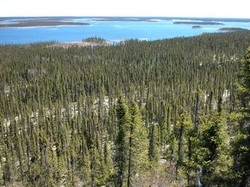 Labrador is a fairly remote province, just in the past few decades has it been accessible by road. 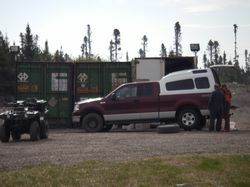 The infamous Labrador Highway is not much of a highway at all, but rather a gravel road. The highway is known for it's heavy snowfall in winter. Upon arriving at the airport, we were issued a rental truck, but no insurance. We weren't supposed to be driving on the Labrador Highway, but the only other place to drive was around Labrador City (more like a small town than city). So, off we went for a 3 hour trip to get to the lodge. It only took four days to get our first flat and a slow leak in a second tire. Luckily, someone was going to town and bought a new tire for us. We didn't have it that bad. Rollie, one of the guides, (above) was on his fifth flat in a week. 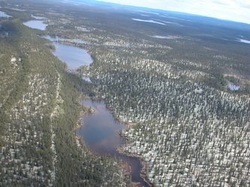 The lodge from the air. In the first week we did 8-12km hikes. 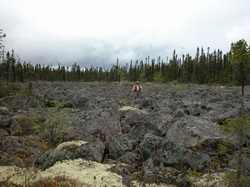 The long hikes were partly because of the easy terrain and partly due to the lack of outcrop. 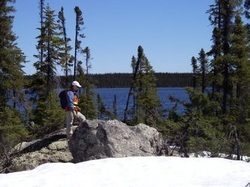 The area was heavily glaciated and most of the rock we saw was in boulder fields. It takes good balance to hop from boulder to boulder, but you can also make great time. There was still snow in places even though it was June. That isn't snow covering the ground, it's caribou moss, a light yellow-green lichen. You can also see a morraine in the bottom left of the photo. 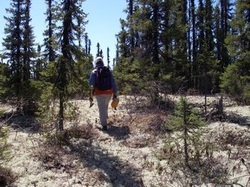 Ruth hiking on caribou moss, if only the bush was always this easy! 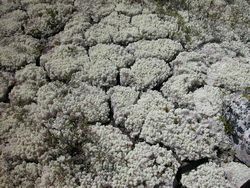 The caribou moss would be crispy and even form cracks during dry times. It made a crunching noise as you walked over it. As soon as it rained, it became soft and there were no traces of footsteps.